In-Game Floating Glitches Made "Real"
You've seen it: game character driving around in invisible cars or riding invisible horses. They're glitches, and before they're patched, they're funny. While not necessarily the intent, a playful series of photos by Chinese artist Zhao Huasen look like real world glitches. 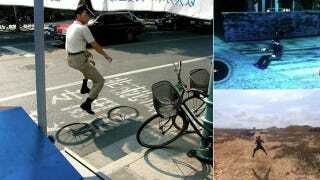 Commuters float on invisible bikes through the streets. The pictures are from a few years back, and the last thing they need now is a patch.